Facebook. Instagram. Twitter. Snapchat. Social media is linked to envy, jealousy, sadness and loneliness. 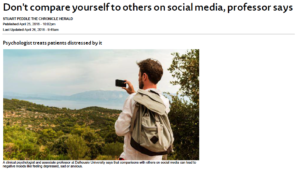 Dr. Simon Sherry discusses the dangers of comparing yourself to other people on social media. Click here to read more.